At a first glance, the natural world appears messy and arbitrary. A pile of data about trees, moose, or any other organism often looks as random as a phone book. And yet, we almost always find some very simple and beautiful mathematical relationships which underlie such messiness. Finding such simple and beautiful mathematics beneath our data make many of us feel like a big chunk of the Universe has fallen into place. This experience is intoxicating, and almost religious. Science, particularly that aspect which describes the patterns in Nature using mathematics, is not usually thought to be aesthetic. Aesthetics is squishy and subjective (“beauty is in the eye of the beholder”) while Science (with a capital S, triumphant bugles blaring!) is objective, hard-nosed, unsentimental, unbowed before mere emotion. And yet, Paul Dirac – one of the foremost physicists of the twentieth century – once said “It is more important to have beauty in one’s equations than to have them fit experiment”. What constitutes the beautiful in the sciences? Is it similar to the beautiful in the arts? Both scientists and artists try to impose some order on nature. We both do this by proposing some very simple rule, then “filtering” the world through that rule. Often, the result gives us pleasure as well as a deeper insight into nature. For the artist, such rules might be the composition rules of classical painting or the rules of ballet. For the scientist, the rules might be finding the simplest set of equations underlying all of nature that conform to the data of our experiments. One point of data on a graph is meaningless. Two points of data begin to show a pattern: as one thing changes, something else increases, decreases, or stays the same. Many points of data may show a complicated pattern, but on closer examination, there may be some simple trends which account for much of it. Similarly, many splotches of paint on a canvas may be complicated, but on examination these follow some simple rules of a particular school – Cubism, for example. The purpose of choosing an equation to describe the pattern inherent in data is not to have a complicated equation that predicts every point exactly. That could in fact be done, but every mathematician would consider such an equation to be ugly. We instead search for equations that are simple and capture the essence of the pattern in an unbiased way. By unbiased we mean that throughout the range of the data the equation does not consistently overpredict or underpredict the experimental results. Curiously, the very same equation often underlies very different phenomena in the natural world. A simple equation that captures the essence of many patterns in the natural world subject to the discipline of fitting the data in an unbiased way is said to be a beautiful equation. A beautiful equation has symmetry and an economy of form; it unifies disparate elements of nature; it provides a maximum of structure from a minimum of inputs; it surprises us with non-intuitive behaviors. These are not unlike the criteria of beauty applied to many works of art. But a beautiful equation has something more: every one of its variables and parameters has measureable biological or physical meaning which allows us to connect it back to the real world. The meanings of the parameters and variables of equations used in ecology often pertain to natural history traits: birth rate, death rate, time to first reproduction, C:N ratios of various tissues, the probability of being eaten by other organisms, dispersal rate, the list goes on. At first glance, natural history and mathematical ecology are as far apart as two subdisciplines of ecology can be. But it is natural history that invests equations with biological meaning and much of their beauty (to biologists at least). This is not just ethereal aesthetic philosophy. An equation is a metaphor for Nature. This metaphor often suggests new experiments which then reveal new patterns which beg for new experiments to explain them. Ugly equations devoid of simplicity, surprise, and the biological meaning that comes from natural history almost never suggest new experiments. That’s why they are ugly. Here, “dx/dt” means “the change in x over some very, very small amount of time, dt”. The equation says something changes (dx) across time in proportion (k) to its size (x) – the simplest way to describe how things change. This equation says that some value, x, at time t equals the value at the beginning, x0, times e (the base of natural logarithms) to the power kt. This equation describes the exponential growth of a biological population, the exponential decay of leaf litter to form topsoil, and the exponential decay of radioactive elements, among many other processes. If instead of time, we replace t in this equation with position in space – say, from one side of a room to another – then this equation describes how the concentration of the smell of oatmeal cookies baking in the oven on one side of your kitchen diminishes across to the other side. The equation thus unifies many disparate processes in nature. This property to unify many natural processes in a simple way is the essence of the beauty of equations. Now consider what happens if we replace t in the above equation with an angle. Call this angle ø. Now, think of a ballerina beginning a pirouette. The angle ø is how much she has turned from her starting position (x0, remember) at any particular time. At the beginning of her pirouette, she is holding her arms straight up. As she turns her arms descend and extend outward at a rate, k, as she rotates on her toe. Her fingertips would inscribe two spirals descending down and outward from the axis of her body. These spirals are captured by the above equation with k representing the rate that the ballerina extends her arms. By making her arms descend and extend outwards at different rates, the ballerina has an almost infinite set of spirals which she can match to the emotions conveyed in a downward scale or arpeggio, for example. The same sorts of descending spirals which ballerinas draw in the air with their fingertips are also very beautiful and simple descriptions of the life histories of snails. Starting out its life as a tiny, tight spiral, a snail grows by enlarging their shells in a spiral down its axis. Each species has its own characteristic rate (k) of forming the spiral. All these different rates of forming the spiral of a shell underlie the bountiful diversity of snails of the world. Knowing the rate at which the spiral expands as the snail’s shell grows allows us to further predict the rate by which the snail must take up calcium from its environment to build its shell. It must take up calcium from the environment in proportion to the growth rate of its spiral; this accumulation of calcium in the shell through time can in turn be described by the same type of exponential equation as describes the growth of the shell’s spiral. 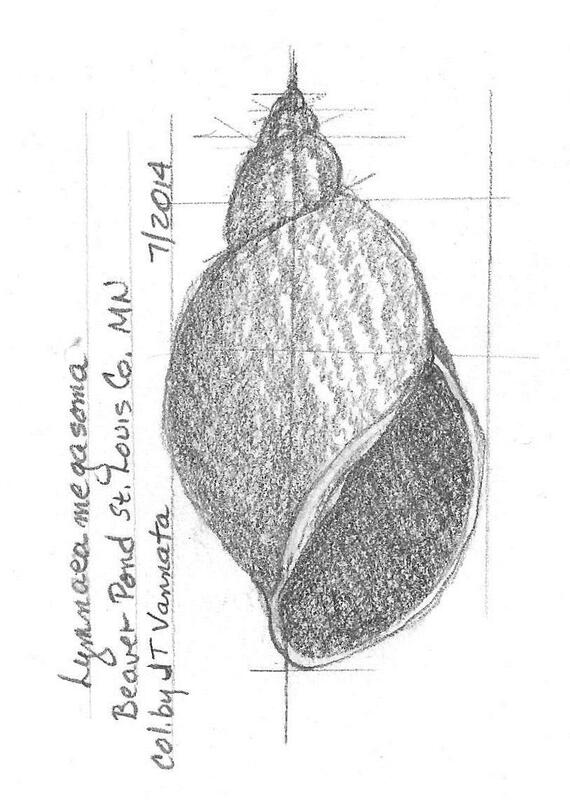 One summer while wading in hip boots in a beaver pond, I found floating in the water a shell of the snail Lymnaea megasoma, the same species as that shown here. Its beauty was striking, and I like to think that my perception of its beauty was further enhanced by my knowledge of the mathematics which unites its spiral with that possessed by all other shells and with its uptake of calcium from the pond. To come full circle from science back to art, Edward Weston, one of the founders of modern photography as an art form, took many dozens of photographs of Nautilus shells. Some of these are of whole shells, but the most gorgeous are of shells cut in half to expose the spiral. This simple equation contains the rules by which a snail grows and interacts with its environment while generating a shape which one of the most famous photographers felt compelled to record again and again simply for its exquisite beauty, as well as the rules by which a ballerina moves her arm to execute a graceful pirouette. Unity underlying diversity. Once you recognize this spiral, you will see it almost everywhere. Interlocking sets of them can be seen if you look straight down at the base of a pine cone. These spirals determine the placement of seeds in sunflowers and leaves around the stems of many plants. A male firefly travels upward on such spirals, his trajectory widening just as the trajectory of the ballerina’s fingertips did, searching for a mate, flashing as he goes. Meinhardt, H., P. Prusinkiewicz, and D.R. Fowler. 2002. The Algorithmic Beauty of Sea Shells. Springer-Verlag, Heidelberg, Germany. Stewart, Ian. 2011. The Mathematics of Life. Basic Books, New York. Vermeij, G. J. 1995. 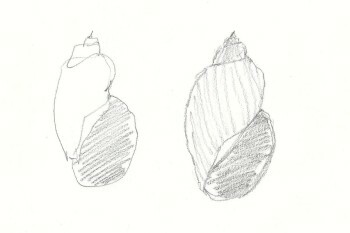 A Natural History of Shells. Princeton University Press, Princeton, NJ.